This is the ultimate mushroom lover's pasta. Mushrooms are one of my favorite ingredients of all time and I came up with this idea of adding porcini mushroom powder to pasta dough in my quest to maximize mushroom flavor in everyday dishes. This recipe packs a porcini punch in every bite and its triple mushroom layers will satisfy the most die-hard mushroom fans - like me. One batch of pasta makes about 450g of porcini fettuccini which serves about 6 people. In this recipe, I used only 150g of the fettuccini for two servings but you can freeze the rest of the pasta for another time or you can make more mushroom sauce and invite a few friends to eat up the whole batch. Put dried porcini in a food processor and run the machine until the porcini becomes powder. Mix flour, salt and porcini powder in a bowl. Put the flour mix on a work surface and make a well. Break the eggs into the well and add olive oil. Gently and slowly mix the eggs with the flour until all the flour, eggs and oil are combined. Knead the dough on a lightly floured surface for 5 minutes. The dough should be smooth and elastic. Cover the dough with plastic wrap and let it rest for 30 minutes. Divide the dough into four portions. *If you want to use a food processor for the dough: After grinding the dried porcini mushroom, add the other ingredients in the food processor and pulse until it becomes a ball. Then follow the same instructions in 5 and 6 above. Shaping the pasta with a pasta machine: Set the pasta machine at the widest setting. With hand or a rolling pin, flatten one portion (1/4) of dough. Crank the dough through the pasta machine. Fold it in thirds, turn 90 degrees, flatten the dough again, and feed through the machine. Continue this process for 8 times. After the eighth time, don't fold the dough at the end. Reduce the width setting of the machine by one notch and feed the dough through. Repeat this process until the dough become the desired thickness. Leave the sheet of pasta uncovered for 10 minutes to dry slightly. 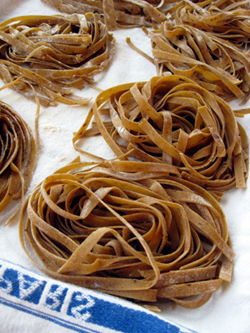 Then cut it into 1/2 - 1/4 inch thick strips using a knife or fettuccini cutter. 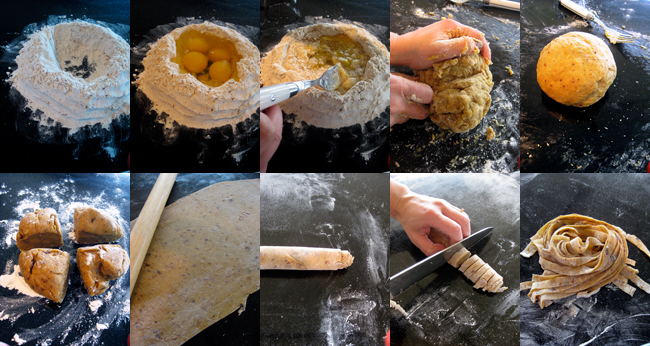 *If you are rolling the by hand: If you don't have a pasta machine, you can make pasta sheets with a rolling pin. On a floured surface, roll one portion (1/4) of dough until very thin. Flour well and roll the pasta sheet and into a log. Use a sharp knife, cut the log into a 1/4 - 1/2 pieces. Then unroll each piece and dry them for 10-15 minutes before you bundle together. Keep 150g of the pasta for the two serving sauce recipe below and save the rest for another time. Heat the olive oil in a large skillet over medium-high heat. Add the garlic, the mushrooms, salt and pepper and cook until the mushrooms expel the water and are tender - about 4 minutes. Add white wine and cook for 30 seconds. Add cream, butter and parmesan cheese and cook until all are combined well. Meanwhile, boil the porcini fettuccini in a large pot with salt until al dente. It should take only 3 minutes or less. Then drain. 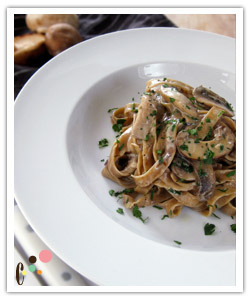 Add the cooked pasta to the mushroom cream sauce and mix well. Plate in a serving bowl/plate and garnish with the Italian parsley. Drizzle some truffle oil on top for even more mushroom goodness (optional).